What we don’t seem to be able to agree on, as a society, is how to level the playing field between people who have more—books, resources, and opportunities—and people who have less. I n this back-to-school issue, I thought I’d talk about getting books to kids. The recent large-scale attempt to solve this problem—the Open eBooks Initiative—is a much-hyped scheme to give ebooks to low-income kids. Featuring big organizations that you’ve heard of—the White House, the Digital Public Library of America (DPLA), the Institute of Museum and Library Services (IMLS), The New York Public Library (NYPL), and one you may not have heard of: First Book—the project was greeted with many simultaneous press releases and not a lot of details. I’m detail-oriented and allergic to hype, so I looked more into how the proposal actually works. Like most projects at this scale, it’s a good news/bad news sort of thing, with lessons that all libraries can take going forward. We all know that reading books to kids is helpful for literacy, bonding, and encouraging a lifelong relationship with reading. I can still remember, as a fifth-grader, having The Hobbit read to us in the last 10 minutes of every school day. We also know that higher literacy correlates strongly with all sorts of good things, such as happiness, success, and reduced stress levels. This set of social goods is one of the large reasons people continue to fund and support libraries. What we don’t seem to be able to agree on, as a society, is how to level the playing field between people who have more—books, resources, and opportunities—and people who have less. This has also, in the past, been an area in which libraries have excelled. There is no main website for the Open eBooks Initiative, but there are a number of press releases available. Here is what I was able to get from them. The White House, as an extension of its ConnectED initiative, is helping broker agreements—mainly through positive press—from major publishers to offer $250 million in free ebooks for the project. DPLA will create the Digital Public Library of America Youth collection (DPLAY) using its Curation Corps, a team of stipended volunteers. It will offer access to public domain titles as well as in-copyright works to children from low-income families. IMLS is investing $5 million in NYPL’s development of an Open eBooks app along with unspecified “tools and services” to help the public access the donated and curated ebooks. First Book does the bulk of the work here. It identifies target populations and screens recipient schools and programs to identify low-income students. This is something it’s done in the past with its existing extensive and successful print-book distribution program. It’s the one that decides who has access to the program’s ebooks via the app. It gives people the passwords. Another minor player is a fun group called Recovering the Classics, “a crowdsourced collection of original covers for great works in the public domain,” encouraging people to judge books (favorably) by their covers. I could not find any press releases from NYPL, which is a little curious since the bulk of the money involved in this project is going to it as part of its app. So my question is, after reading all of this, “How does it work?” I had some conversations with people at DPLA and put most of this together. The app, which IMLS says “leverages the free and open source Library Simplified app,” is being developed to work on Android and iOS devices. A web/desktop version is planned but is not part of the initial program. It will be usable by print-disabled users as well as people who read print. 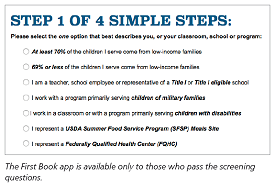 The free ebooks are available to any child “who [has] an adult person registered with First Book.” This odd language is a way of explaining that First Book registration is only available to “educators, service providers and programs” and not to individual families. A child wanting to use this app has to have an adult who is preregistered with First Book give him or her a code to access content. The ebooks will have DRM on them. First Book’s registration process is rigorous, which is the good news; however, it is also complex, which isn’t as good. You can look at the categories of people who are eligible. 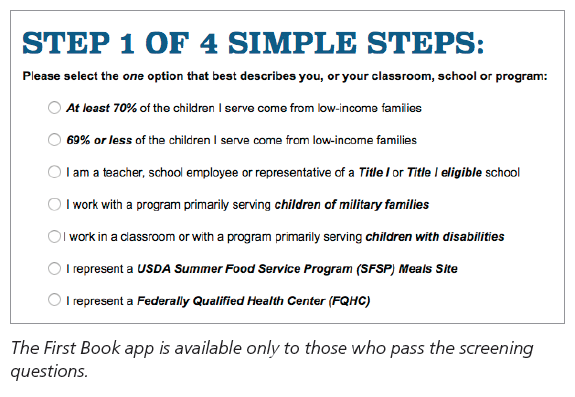 Note that if you select “69% or less of the children I serve come from low-income families,” you are not allowed to register. So you can give 100 kids ebooks for nearly the same cost as you could give 1,000 kids ebooks or 10,000. This is not at all the case with print materials. And speaking of the publishers—are they just going to be giving these books away for free? What’s in it for them? This was the part of the story that had the biggest numbers—$250 million in free ebooks—and the fewest details. Some publishers are offering their entire youth ebook catalogs; others are providing “a robust offering” of titles. It’s not clear if DPLA’s Curation Corps is going to have to sift through these to choose titles for inclusion or if they’ll all be available. One thing is certain: At least some of these publishers are only offering these ebooks for a finite period of time. What does it mean to make a time-limited “donation” of ebooks in this fashion? I know if I donated copies of a print book to a nonprofit, I could take a tax write-off for them. I am very curious to know how that works in an ebook environment. What’s not clear at all is how this will work in practice. Even the FAQs say that there is no digital literacy component to this program. Similar programs with content delivered to low-income students via devices have suffered from a lack of trained staffers to help people navigate the applications and the technical problems that might arise. Teachers reported having to spend large amounts of class time just troubleshooting issues with the devices and report that “making the materials ‘usable’ has required ‘extraordinary, unsustainable, and un-scalable resources,’” per an article in the Los Angeles Times. So the downside of projects that leverage economies of scale is they can also leverage economies of support troubles. There has been no mention of who will be supporting this program or even if it will have support as a component. The ebook landscape is challenging—politically and technologically—in a way that the print-book landscape is not. This project looks as if it’s good at addressing some of the pesky political problems surrounding ebooks, but it is possibly a bit glib about the technological issues that’ll be generated by an endeavor of this magnitude. Getting technology to function smoothly and mostly invisibly is a hidden cost of managing ebook programs at libraries currently. So I’m excited, but also cautious about this project. We’ve seen a lot of well-meaning projects come and go. Tech support is a part of the project that won’t scale well and, so far, isn’t being addressed. The hardest to serve are often the hardest to serve specifically because they can’t be reached simply with apps, goodwill, and a pure heart. If that was all it took, our work would be done already. Libraries have been working at easing the literacy divide, the digital divide, and the empowerment divide for decades, if not centuries. No one wants to increase literacy and love of reading more than the public librarians of the world, but it’s still unclear if this project is the way forward to reach those goals. Jessamyn West works at Open Library and wants to give content away to everyone. Her blog is librarian.net.